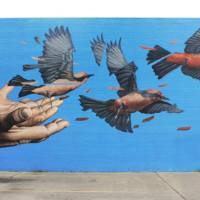 This mural was created by James Bullough with the Handle with Care Project, a Dallas-based organisation that is dedicated to fighting slavery through the arts. They argue that graffiti and slavery have something in common - they are both done covertly and are illegal, yet when a wall is defaced it can be painted over, whereas there is no "easy solution" for the slavery survivor.This piece 'Flycatcher 4' is one of four murals of individual birds that are dotted around the city and link back to the main mural of the project 'Release'. 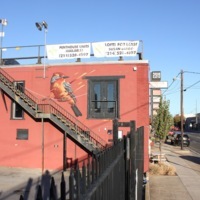 Unfortunately the building was demolished and the mural has been destroyed. This mural was created by James Bullough with the Handle with Care Project, a Dallas-based organisation that is dedicated to fighting slavery through the arts. They argue that graffiti and slavery have something in common - they are both done covertly and are illegal, yet when a wall is defaced it can be painted over, whereas there is no "easy solution" for the slavery survivor.This piece 'Flycatcher 3' is one of four murals of individual birds that are dotted around the city and link back to the main mural of the project 'Release'. 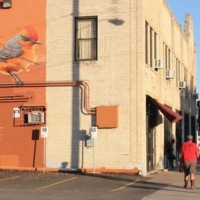 Although the building has been painted black, the mural survives in a patch of the red paint. This mural was created by James Bullough with the Handle with Care Project, a Dallas-based organisation that is dedicated to fighting slavery through the arts. They argue that graffiti and slavery have something in common - they are both done covertly and are illegal, yet when a wall is defaced it can be painted over, whereas there is no "easy solution" for the slavery survivor.This piece 'Flycatcher 2' is one of four murals of individual birds that are dotted around the city and link back to the main mural of the project 'Release'. The mural still survives today. This mural was created by James Bullough with the Handle with Care Project, a Dallas-based organisation that is dedicated to fighting slavery through the arts. They argue that graffiti and slavery have something in common - they are both done covertly and are illegal, yet when a wall is defaced it can be painted over, whereas there is no "easy solution" for the slavery survivor.This piece 'Flycatcher 1' is one of four murals of individual birds that are dotted around the city and link back to the main mural of the project 'Release'. Unfortunately the building on which this mural was painted has now been destroyed. This mural was created by James Bullough with the Handle with Care Project, a Dallas-based organisation that is dedicated to fighting slavery through the arts. They argue that graffiti and slavery have something in common - they are both done covertly and are illegal, yet when a wall is defaced it can be painted over, whereas there is no "easy solution" for the slavery survivor. 'Release' is the central piece in a city-wide mural project 'Deface a Wall, Not a Body', painted at the popular retail park Trinity Grove. 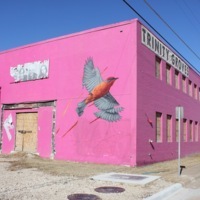 The birds that are released in this mural are then painted all around Dallas. They symbolise survivors being released from captivity and rebuilding their lives over time. 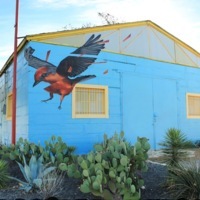 The murals of these free birds are titled 'Flycatcher'.